The Immortal Life of Henrietta Lacks - Complete Unit (UPDATED)! This download contains three items: First, a 50 question multiple choice test on the novel. Secondly, two true/false quizzes - one over part 1 of the novel and the other over part 2. The download comes with answer keys for the test and quizzes. You will hand this sheet out to your students and they will complete the questions during a 9 minute youtube video. The video is from The Sunday Morning TV program and serves as an introduction to Henrietta's Life. 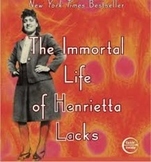 Immortal Life of Henrietta Lacks Introductory Material. This quiz checks for comprehension - based on chapters 1-5. Multiple Choice questions and one short answer response. This is a quiz covering basic reading and vocabulary from Ch. 1-4 of The Immortal Life of Henrietta Lacks by Rebecca Skloot. It includes multiple choice, matching, and short answer. I can provide an answer key upon request. Culminating activity to accompany a reading of "The Immortal Life of Henrietta Lacks." Can also accompany just a reading of excerpts. 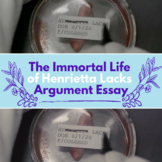 This 15-question quiz tests a student's basic comprehension of reading The Immortal Life of Henrietta Lacks: Part One. An answer key is included. Twenty (20) multiple choice and true/false reading comprehension questions from chapter 12-16 of The Immortal Life of Henrietta Lacks. Answer key included. Henrietta Lacks - Black History Lesson This short lesson is great for primary grades in preparation for the more extensive lesson. 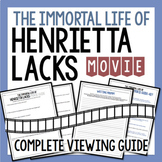 It gives you the life and history of Henrietta Lacks and is followed by a printable lesson. Reading Comprehension quiz for Chapters 6-11 of The Immortal Life of Henrietta Lacks. Sixteen questions for recall and for inference. Answer key provided.